Savor a delicious home-cooked breakfast in the morning, enjoy the foliage and crisp air during the day, and retire to your cozy room in the evening - this is the simple and sastifying experience you'll have when you stay at one of the following bed and breakfasts. 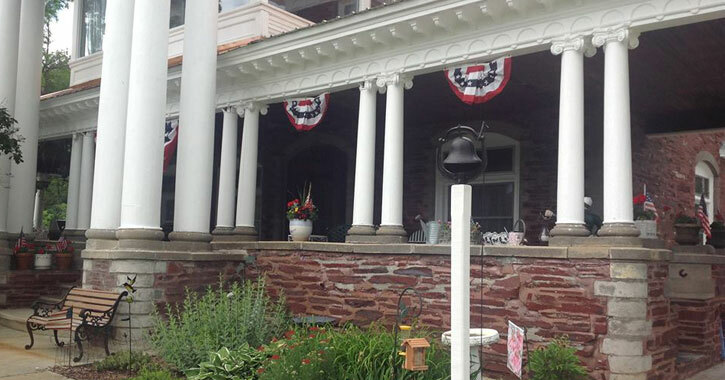 In addition to comfortable accommodations and delicious food you can also take a step back in time, as the majority of these bed and breakfasts have a rich history. You'll see striking architecture and fascinating antiques as you stay in a centuries-old building. The following bed and breakfasts are all conveniently located just a short drive from Saratoga. Make the most of the fall and winter season this year by treating yourself to a few days of rustic country living among some of the best foliage you can find in the entire northeast. When you stay at The Inn on Lake Champlain in Putnam Station you'll be on a 440-acre horse farm spending the night in a centuries-old Victorian farmhouse. The Inn is just east of Lake George on the western shore of Lake Champlain, so you'll get to enjoy lakeside views along with the Green Mountains of Vermont and the Adirondack Mountains to the west. Breakfasts are created from farm-fresh products using seasonal, local, natural, and organic ingredients. While waiting for your breakfast you can sit on the wrap-around porch, just taking in the sights on the lush property. If you crave something sweet with breakfast you're in luck - in addition to typical breakfast foods like quiche and pancakes, chocolate éclairs, crepes, cinnamon buns, and other delicious foods are served. 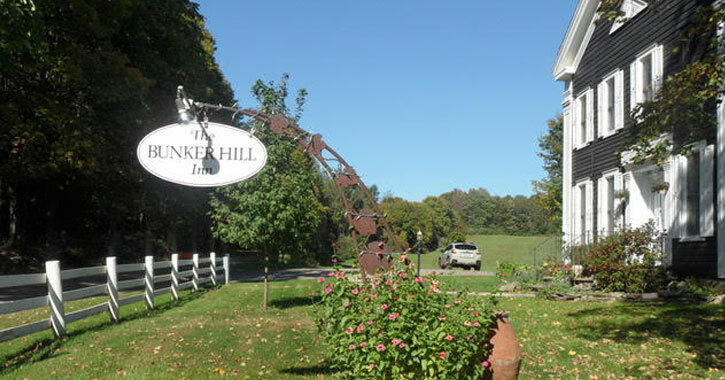 Nestled in between the foothills of the Adirondacks and the Green Mountains of Vermont you can find hospitality and a warm welcome at the Bunker Hill Inn, located in Salem. You'll be surrounded by woods, meadows, and farmland, tea and coffee are left outside your door each morning, and a full country breakfast is served. Indulge in local maple syrup, fresh fruits and vegetables - most of which are harvested right from the Inn's property - eggs from their own chickens, bacon, and sausage. When staying at Bunker Hill you'll be a short drive away from Salem and Greenwich, where you'll have access to gourmet dining, unique shops, and art galleries. Head just a bit farther east and enjoy all Vermont has to offer. Note: As of October 2018 the Hopkins House is closed. 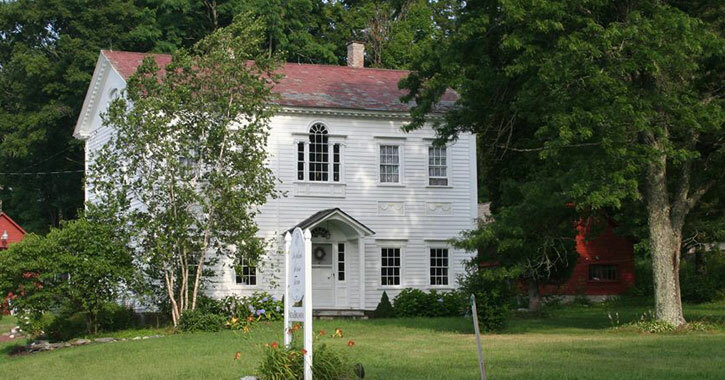 The Hopkins House Farm Bed & Breakfast in Hebron also has a longstanding history, having been built in 1790. Captain David Hopkins chose this location in Salem for his farm because of the beautiful location on a gradual slope. The two story farmhouse has high ceilings and an architectural style that gives a nod to Greek influences. The current owners of the bed and breakfast, Aggy and Charlie Duveen, have been welcoming guests since 1997. Although they've made significant efforts to protect the historical legacy of the house they have also made a number of structural repairs and electrical updates to ensure the comfort of those staying at the Hopkins House. 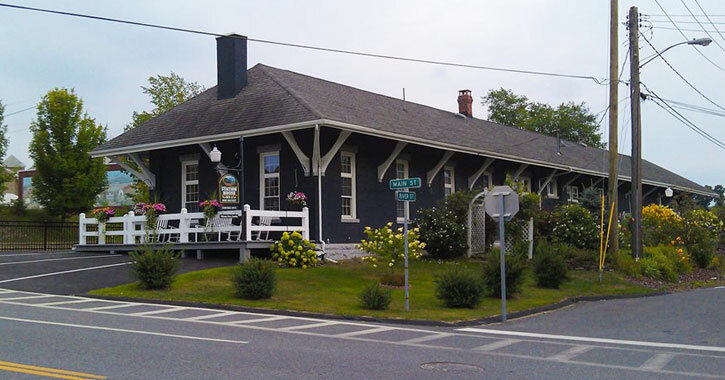 The Station House Bed and Breakfast, located in Granville, is a 100+ year old house that has been renovated from a D&H Railroad Station. The rooms accordingly are named with railroad themes: The Side Car, The Freight Office, Conductor's Room, The Caboose, and the Ticket Office. The rooms have a Victorian feel to them with the furniture and floors, and two include private balconies overlooking a perennial garden. The Slate Valley Museum & Pember Library & Museum are within walking distance of the bed and breakfast - did you know Granville is considered to be the Slate Capital of the World? A number of other attractions can be found in the area with shopping, skiing, and boating. You'll enjoy picturesque mountain views and an exceptional breakfast at The Sheldon Mansion Inn Bed & Breakfast in Granville. In addition to the homemade baked goods, fresh fruit, yogurt, and more for breakfast, the Mansion keeps popcorn, ice cream, additional baked goods, and more amenities on hand for you at all times. The 34-room, 10,000-square-foot mansion is truly a unique building with a rich history. The mansion was built in 1906 by slate baron Frederick Sheldon who is believed to have owned the most rare, red slate. In fact, it is believed that this is the only building in the entire world constructed with red slate stone walls. The estate was converted to a small hopsital during World War II and transformed into an assisted living facility in the 1970s, before becoming the bed and breakfast it is today in the 2000s. 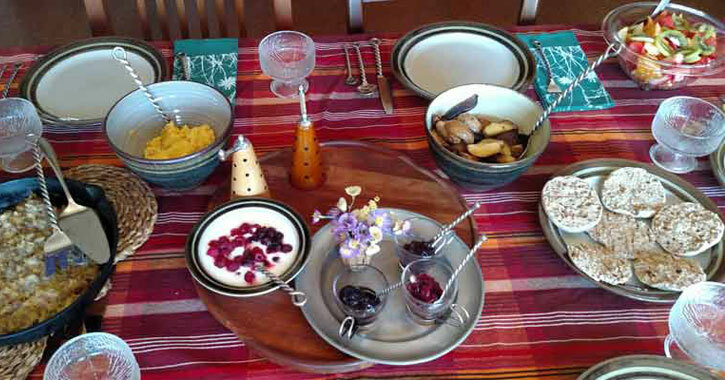 If you can't get enough of the farmers market this is probably the bed and breakfast for you. 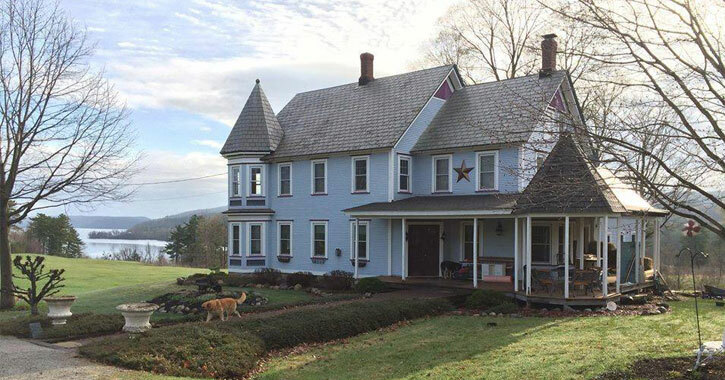 Lant Hill Farm Bed & Breakfast in Argyle is both a B&B and a working farm, with activities going on all year. One unique crop this farm cultivates is hardy kiwi, a cousin of the better known fuzzy kiwi. These tasty little fruits tend to ripen towards the end of farming season in the fall, so ask the owners if you can give them a try during your visit! And of course, you can be rest assured you're getting the best of the best when it comes to a full farm fresh breakfast in the morning. Lant Hill makes their own maple syrup on site, along with a number of fruits and berries that can be turned into popovers and more delectable treats. If you're looking for a bed and breakfast experience as part of a group outing the Rice Mansion Inn is for you. This bed and breakfast requires guests to stay as groups and to utilize all eight rooms in their Carriage House, and they're open May through October. 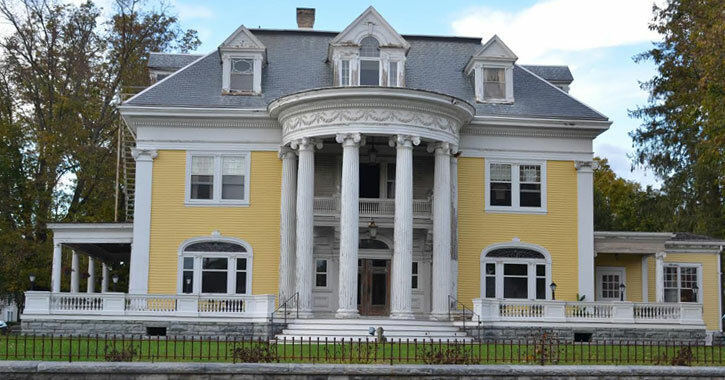 The Rice Mansion Inn in Cambridge has a rich history, having been standing since the early 1900s. In 1901, the Crocker Mansion was torn down to make way for the home of tycoon and owner of the Rice Seed Company, Jerome B. Rice. The family hosted hundreds of people in their home, although Rice passed away in 1912, just a few years after the mansion was completed. His legacy and sense of hospitality continues on at the inn. Today, the mansion is full of small details that reflect its history in the ceilings, fireplaces, and more. As you relax on the porch for breakfast, or enjoy tea in one of the parlors, it's easy to get swept away in years past. Although the owners do a great job of paying homage to Rice's legacy, they also have enhanced the inn to accommodate modern guests. As with other bed and breakfasts near Saratoga, Stella Rose Bed and Breakast has a proud history, having been built in the late 1880s. Although, they pride themselves on providing 21st century accommodations. Stella Rose is centrally located in Hartford, close to Saratoga, Lake George, and Vermont. Home cooked breakfasts at Stella Rose include fresh fruit, muffins, sweet breads, coffee, tea, and juice, followed by your choice of eggs, pancakes, or waffles, and your choice of meat. The owners believe in taking excellent care of their guests, making them feel at home from the moment they step foot into the Victorian-style house. New York State Department of Economic Development; used with permission.